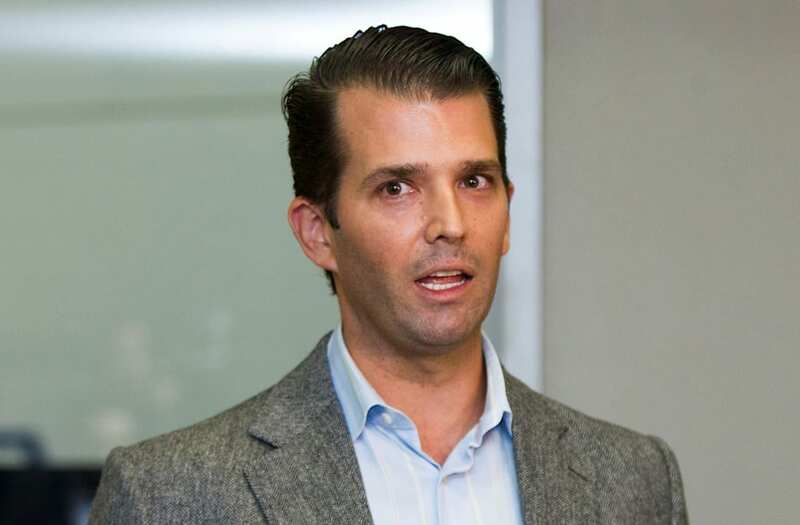 Donald Trump Jr. on Wednesday claimed the Democratic National Committee's platform in the present day is similar to the "Nazi platform of the 1930s." The president's eldest son was attending a screening of far-right filmmaker Dinesh D'Souza's new documentary, "Death of a Nation: Plantation Politics and the Making of the Democratic Party." Trump Jr. said, "You see the Nazi platform from the early 1930s ... and you look at it compared to the DNC platform of today, you're saying, 'Man, those things are awfully similar' to a point where it's actually scary.'" Speaking at a screening of far-right filmmaker Dinesh D'Souza's new documentary, the eldest child of the president contended the left is unfairly labeling the right as fascists and Nazis. "I've been out hearing the left talking about all these things ... fascism, Nazism on the right. When you look at the actual history of how these things evolved, and when you actually look at that platform versus the platform of the modern left, you say, 'Wait a minute, those two are really heavily aligned and frankly contrary to the right,'" Trump Jr. said at the premiere of "Death of a Nation: Plantation Politics and the Making of the Democratic Party." Trump Jr. said academia has been "wrongly" influenced by the left and led people to have misconstrued notions of what fascism and Nazism are. "You see the Nazi platform from the early 1930s... and you look at it compared to the DNC platform of today, you're saying, 'Man, those things are awfully similar' to a point where it's actually scary. It's the exact opposite of what you've been told," Trump Jr. added. Trump Jr. did not get into specifics in terms of what he meant regarding Democrats and the Nazis having similar platforms. D'Souza told The Hill that his new documentary is about diving into what "racism and fascism" really "mean." The film has seemingly convinced Trump Jr. that present-day Democrats and the Nazi party in the lead-up to World War II and the Holocaust are quite similar. "When you look at the movie, you'll see that there is a very distinct and clear difference between what actually happened and what is being sold to our youth today," Trump Jr. said of the film.